Big Rooster Construction is ready to move with the carpentry industry, wherever it’s headed. With social media savvy, business and marketing nous, and an eagerness to improve and adapt, Managing Directors Jamie Yeomans and Ashley Formston have found quick success among Melbourne’s chippies. But Jamie believes the secret to their strong reputation and loyal customer base is more old school: they’re just good people to be around. “We’re a younger crew and everyone gets along. When we finish for the day it’s not like we’re in a rush to get home or anything, we stick around for a chat,” he said. 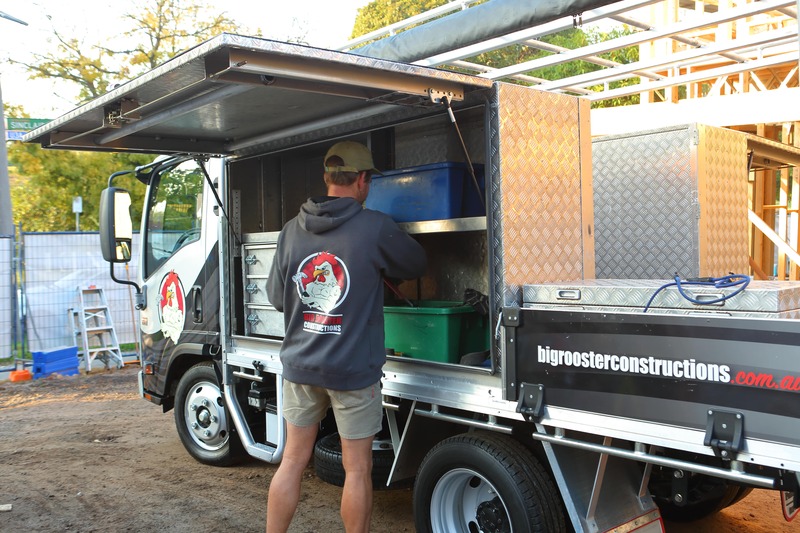 Big Rooster offers a range of carpentry services, from constructing frames, lockups, decks and pergolas, to providing repairs, renovations, fixes, extensions, restaurant and shop fitouts, and pretty much anything else you can do with a length of timber. Jamie and Ashley have notched up consistent triumphs in the two years since they struck out on their own, ballooning from a two-man operation to a team of eight employees. Jamie attributes a lot of this to the company’s iconic logo (designed by talented mate, Sean Dwyer) but there’s another factor that’s obvious when talking to him or scrolling through Big Rooster’s social media pages – a deep pride in their work. The company’s Facebook and Instagram feeds are full of photos, videos, and on-site commentary celebrating the beautiful projects the guys work on, and these posts have proven to be a great tool for attracting more work. “Both Ash and I see the industry and society moving towards people using social media to find their tradies,” Jamie said. 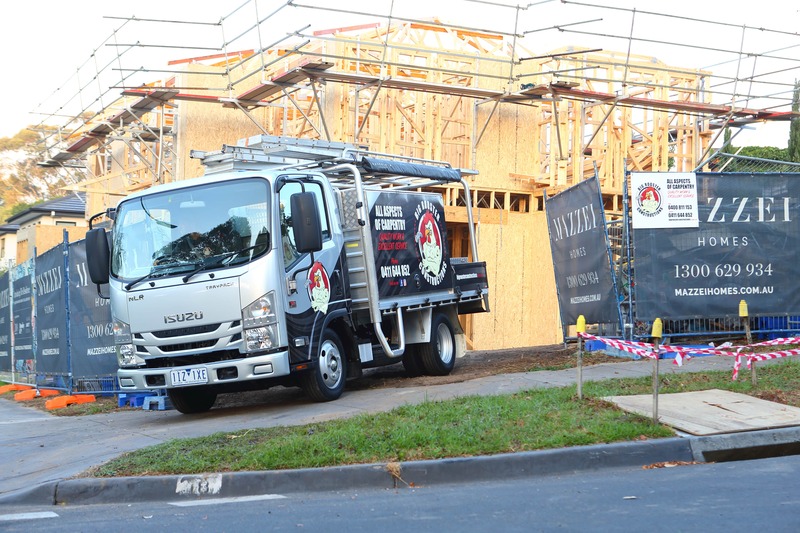 This philosophy of using technology and every other tool to their advantage runs throughout the business, so when Big Rooster needed a new vehicle, it was only after a rigorous selection process that Jamie chose his Isuzu NLR 45-150 short wheelbase Traypack. “It took me a while to decide, to be honest,” Jamie said. “I test drove a few different trucks, went through all the reviews, but the Isuzus were a clear winner. “They’ve got the best resale value too, which is important in the long term. I mean, I’m planning to have this truck for the next ten years. 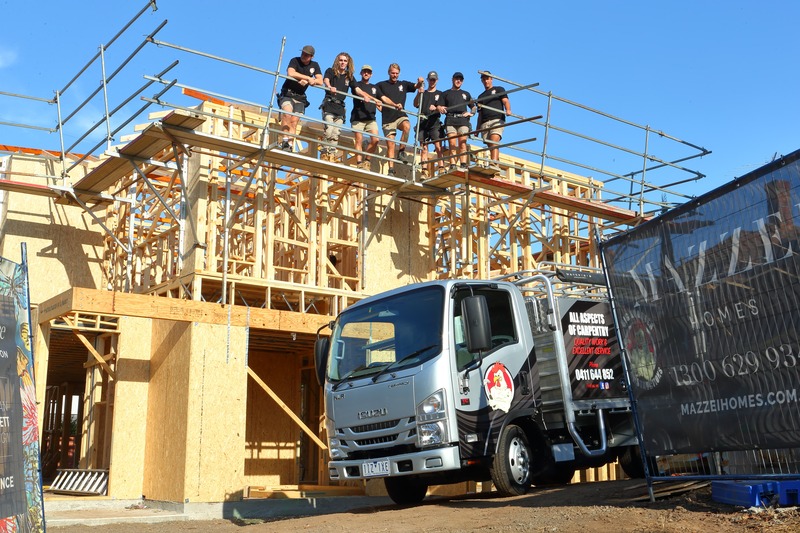 The NLR Traypack is a member of Isuzu’s Ready to Work range – a collection of pre-bodied trucks designed to allow customers to drive straight from the dealership to the worksite (once registered and insured). Jamie was particularly impressed with the amount of room the Traypack offered, even after installing his two, two-metre toolboxes in the back. “I’ve still got room down the middle, where I chuck small ladders and saw benches, or if we need to do tip runs the boys will bring rubbish and load it up; plus we have roof racks that run the whole body, because we’re constantly carrying heaps of ladders and scaffold,” he said. “The way that carpentry is now, it’s necessary to have all the tools you might possibly need on hand at any time, so having good access is crucial. “And because the Traypack will go anywhere, we’ve set it up so that I can rock up to any jobsite, open the toolbox doors, and leave it there all day for the boys to pick out whatever they need. It’s like carrying a little shed around in the tray. The NLR’s extra space has been handy recreationally too, as Jamie’s converted it into a comfy weekend-getaway vehicle. “I’ve got an awning that comes off the side and a tent that fully encloses, so my girlfriend and I took it up to Byron Bay over the break – I emptied the toolboxes out and away we went,” he said. The Traypack’s 4,500 kg GVM means it can be driven on a car licence, and it’s been engineered with car-like driveability and a compact design, despite all that space. “The AMT is fantastic around the city, and I can still get it into any shopping centre carpark!” Jamie said. Overall, he’s incredibly positive about his choice. Between bustling from job to job, and the odd trip up North, the vehicle’s put 32,000 kms on the clock in the year since it was bought, and it hasn’t missed a trick. “I haven’t doubted this truck once,” he said. “Ever since I bought it I’ve had nothing but good things to say about it, and I’ve actually convinced some of my mates to get one too. As for Big Rooster’s push into the future?